One of things I’m enjoying most about my new kitchen is the counter space on the island where I can work with dough. First, there’s plenty of room to knead and divide and roll dough. And, second, the smooth Silestone surface makes working with dough easier than ever. I use less flour than I did in the past because it’s so smooth. So, I was delighted to peruse all the bread recipes in the book Bien Cuit , by Zachary Golper and Peter Kaminsky, of which I received a review copy. 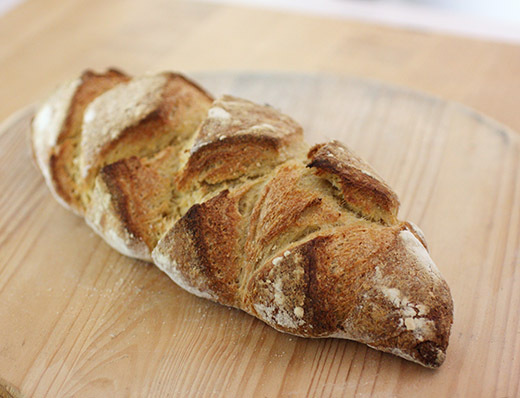 After reading it, I wondered if I could take a hiatus from work and all other time commitments and just bake bread until I had tried everything in the book. Bien cuit, or “well done,” refers to a dark, lovely crust that’s not burnt but completely browned. It brings flavor and texture to a loaf. I became a quick fan of the book because all of the breads are made with a starter or pre-ferment. Not all of the starters are sourdough, some are made with commercial yeast, but they all involve stages of long, slow fermentation for flavor development. That’s how I love making bread. There are classic loaves and styles and also some reinterpretations and new inventions. The Portuguese Corn Bread, or broa de milho, is made with a cornmeal and rye starter and is baked into a pretty, round loaf. The Ciabatta, one of my favorite breads, is made a little differently than other recipes I’ve tried. It’s made with a yeast starter, and the completed dough is left to rest in the refrigerator overnight. I have to try it soon. There are variations on sourdough loaves and a Sourdough Rye Bread I’d like to try. Then, there’s a chapter just for rolls. Toasted Oatmeal Rolls, Late-Harvest Carrot Rolls with roasted carrots and carrot juice, Port and Fig Rolls, Kaiser Rolls, Sun-Dried Tomato Mini Baguettes, and all the others are calling my name. The Quick Breads chapter includes biscuits and scones, and the method for scone making involving layering the dough and baking the scones cut side up was very intriguing. And last, there’s a chapter with instructions and photos showing each and every step needed to create these recipes. I so wish I could just bake from page to page until I’ve tried everything. But, alas, I’ll have to work my way through the book when time allows. I started with the Bourbon Bread because I’d never seen anything like it. It’s a yeast-raised, cornmeal and flour bread made with bourbon in place of some of the water in the dough. As with all the breads here, you’ll need to plan ahead. This bread was started two days before it was baked. The starter was made with cornmeal, white flour, instant yeast, and water. It was mixed and left at room temperature for about 12 hours. The dough was made by combining the starter with water to loosen it from its bowl and then mixing it with more water and bourbon. A mixture of flour, cornmeal, sugar, salt, and yeast was added to the starter and water. The dough was mixed with a spoon and then folded repeatedly with a bowl scraper to incorporate all the ingredients. Then, the dough was rolled and tucked by hand and left to rest. During the next two hours, the dough was stretched and folded four times. During the third stretching, butter was spread over the surface of the dough before it was rolled up and left to rest before the fourth fold. To form loaves, the dough was divided into two parts, each part was shaped into a tube with slightly pointed ends, and the loaves were deeply cut with crossing lines to form diamond shapes. The shaped loaves were transferred to a flour-dusted, towel-lined baking sheet with the cut sides down, and they were refrigerated for 16 to 22 hours. The next day, they were baked on a baking stone with steam. I’ve mentioned before that every bread book I read includes a different technique for creating steam in a home oven. The technique suggested here is the cast iron pan with ice in the bottom of the oven approach which is easier than opening the oven repeatedly to spritz with a spray bottle. The loaves baked for about 28 minutes. 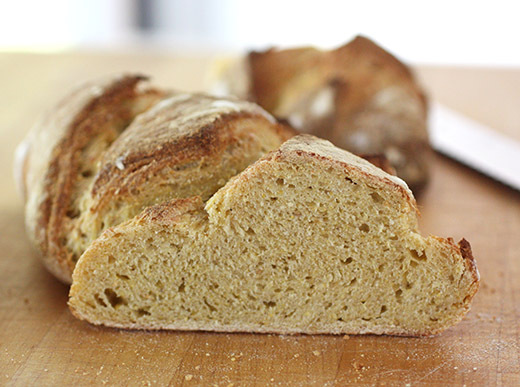 The bourbon and cornmeal make this a fragrant, sweet-smelling bread. The crumb is tender inside the crunchy crown of a crust. In the head note, Kentucky ham is suggested as a perfect pairing with this bread, and that makes sense. I went with smoked chicken and blue cheese and can report they make an excellent accompaniment as well. I don’t think I’ll be making room on a shelf for this book just yet. I have lots more baking to do first. Excerpted from Bien Cuit by Zachary Golper and Peter Kaminsky. Copyright © 2015 by Zachary Gopler. Excerpted with permission by Regan Arts. I am very excited about this bread, in part because I think bourbon is one of the most elegant beverages. It is simultaneously sweet and bitter, smoky and smooth, and graced with the subtle vanilla notes of oak. Because bourbon is a corn-based whiskey, I include corn in the bread—both in the starter and the dough. I had thought it was a nice accompaniment to a vegetable course or salad. Then Peter served it with a slice of Kentucky ham (which, like bourbon, is one of the glories of the Bluegrass State). It was off the charts! The only thing missing was a mint julep. My one caution in regard to baking with bourbon (or any whiskey) is that it has a bitter component that can overpower, so don’t be tempted to put in a touch extra for good measure. The choice of bourbon is up to you. Common wisdom is that when cooking with wine, it’s best to use a wine you would like to drink. The same holds true for baking with whiskey. My choice here is Ezra Brooks because it’s pretty mellow, not overpowering, and not super expensive. 1 Stir together the cornmeal and white flour in a medium storage container. Sprinkle the yeast into the water, stir to mix, and pour over the cornmeal mixture. Mix with your fingers, pressing the mixture into the sides, bottom, and corners until all of the flour is wet and fully incorporated. Cover the container and let sit at room temperature for 10 to 14 hours. The starter will be at its peak at around 12 hours. 1 Stir together the white flour, cornmeal, sugar, salt, and yeast in a medium bowl. 2 Pour about one-third of the water around the edges of the starter to release it from the sides of the container. Transfer the starter and water to an extra-large bowl along with the remaining water and the bourbon. Using a wooden spoon, break the starter up to distribute it in the liquid. 3 Add the flour mixture, reserving about one-sixth of it along the edge of the bowl. Continue to mix with the spoon until most of the dry ingredients have been combined with the starter mixture. Switch to a plastic bowl scraper and continue to mix until incorporated. At this point the dough will be just slightly sticky to the touch. 4 Push the dough to one side of the bowl. Roll and tuck the dough, adding the reserved flour mixture and a small amount of additional flour to the bowl and your hands as needed. Continue rolling and tucking until the dough feels stronger and begins to resist any further rolling, about 8 times. Then, with cupped hands, tuck the sides under toward the center. Place the dough, seam-side down, in a clean bowl, cover the top of the bowl with a clean kitchen towel, and let rest at room temperature for 30 minutes. 5 For the first stretch and fold, lightly dust the work surface and your hands with flour. Using the plastic bowl scraper, release the dough from the bowl and set it, seam-side down, on the work surface. Gently stretch it into a roughly rectangular shape. 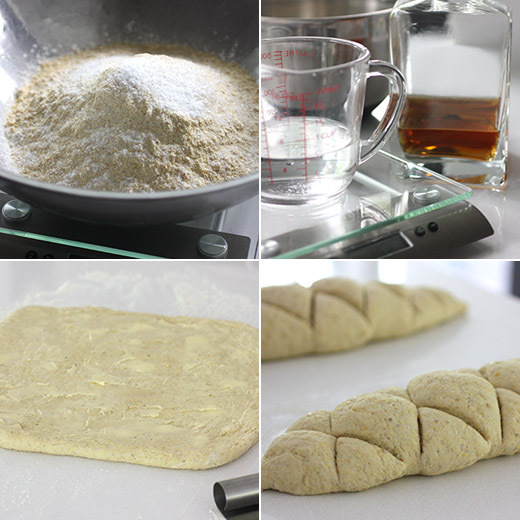 Fold the dough in thirds from top to bottom and then from left to right. With cupped hands, tuck the sides under toward the center. Place the dough in the bowl, seam-side down, cover the bowl with the towel, and let rest for 30 minutes. 6 For the second stretch and fold, repeat the steps for the first stretch and fold, then return the dough to the bowl, cover with the towel, and let rest for 30 minutes. 7 For the third stretch and fold, gently stretch the dough into a rectangle. Pinch the butter into pieces, distributing them over the top of the dough. Using your fingers or a spatula, spread the butter across the surface of the dough. Roll up the dough tightly from the end closest to you; at the end of the roll the dough will be seam-side down. Turn it over, seam-side up, and gently press on the seam to flatten the dough slightly. Fold in thirds from left to right and then do 4 or 5 roll and tuck sequences to incorporate the butter. Turn the dough seam-side down and tuck the sides under toward the center. Return the dough to the bowl, cover with the towel, and let rest for 30 minutes. 8 For the fourth and final stretch and fold, repeat the steps for the first stretch and fold, then return the dough to the bowl, cover with the towel, and let rest for 20 minutes. 9 Line a half sheet pan with a linen liner and dust fairly generously with the dusting mixture. 10 Lightly dust the work surface and your hands with flour. Using a bench scraper, divide the dough into 2 equal pieces. Press each into a 7-inch (18 cm) square, then roll into a loose tube about 7 inches (18 cm) long. Let rest for 5 minutes. Press each piece out and then shape into a very tight tube 9 to 10 inches (23 to 25 cm) long. Using a bench scraper, make 3 to 5 cuts on the diagonal down the loaf. Then, make 3 to 5 cuts in the opposite direction, crossing the first set of cuts, to make diamonds. 11 Transfer to the lined pan, cut-side down, positioning the loaves lengthwise. Dust the top and sides of the dough with flour. Fold the linen to create support walls on both sides of each loaf, then fold any extra length of the linen liner over the top or cover with a kitchen towel. Transfer the pan to the refrigerator and chill for 16 to 22 hours. 12 Set up the oven with a baking stone and a cast-iron skillet for steam, then preheat the oven to 480°F (250°C). 13 Using the linen liner, lift and gently flip the loaves off the pan and onto a transfer peel cut-side up. Slide the loaves, still cut-side up, onto a dusted baking peel. Working quickly but carefully, transfer the loaves to the stone using heavy-duty oven mitts or potholders. Pull out the hot skillet, add about 3 cups of ice cubes, then slide it back in and close the oven door. Immediately lower the oven temperature to 440°F (225°C). Bake, switching the positions of the loaves about two-thirds of the way through baking, until the surface is a deep, rich brown, with some spots a long the scores being very dark (bien cuit), about 28 minutes. 14 Using the baking peel, transfer the loaves to a cooling rack. When the bottoms of the loaves are tapped, they should sound hollow. If not, return to the stone and bake for 5 minutes longer. 15 Let the bread cool completely before slicing and eating, at least 4 hours but preferably 8 to 24 hours. I wish you could spend all your days in your new kitchen baking bread from this book too:) Just look at that heavenly loaf! What spectacular loaf of bread! It looks wonderful, and I can see why you feel like staying at home and baking every single loaf in it! I have to admit I have never seen such bread with bourbon before! Craving a thick slice of this scrumptious bread! Happy to hear you have lots of projects to explore in your new kitchen. Happy baking! It look heavenly! Love the perfectly thick crust and even crumb, and of course the add of Bourbon. I've made plenty of desserts with a touch of bourbon in them. But bread? Wow, that's a new one. And it so intrigues me. I am going to have to bookmark this one for when I can spend a few days (ah, yes, the commitment of making bread) to make this lovely loaf. One of the biggest mistakes in remodeling my kitchen (have since moved from that house) was putting my icemaker under the granite counter. Never thought of it at the time, but it made the counter warm so I couldn't use it for rolling out cookies or pie crust! However, it would have been a plus for this bread. I loved reading about it and it looks fabulous, Lisa. I have one other bread recipe sitting on my desktop to make....I just don't seem to find the time to get going on it. I need a rainy day! But I'll add this one to my list. Beautiful crumb and sounds divine. Fresh bread is the best! It looks delicious, Lisa. This bread look delicious and beautiful Lisa. I love make bread. Lovely! Loved the shaping and slashing of this loaf, Lisa... very beautiful!